I was coming back from a decorative painting job out in the Hamptons and I came across this wonderful old antique shop named Lloyds in Eastport, New York. I had passed this store many times before and finally – I had a little bit of time to go in and take a look. The store is a lot larger than it appears from the outside – and there are two large floors full of antiques. Just what I needed – a ton of stuff to choose from! Anyway, I fell in love with a couple of things that I just had to pick them up (I only had about 20 minutes to peruse because I had another appointment to go to). I picked up these two boards that were very ornamental, They may have been parts of other pieces of furniture…but they were so beautiful I just had to pick them up. $90 in total for the two – not too bad. First. I gave the base of the board a bit of lightening with French linen from Annie Sloan Chalk Paints. 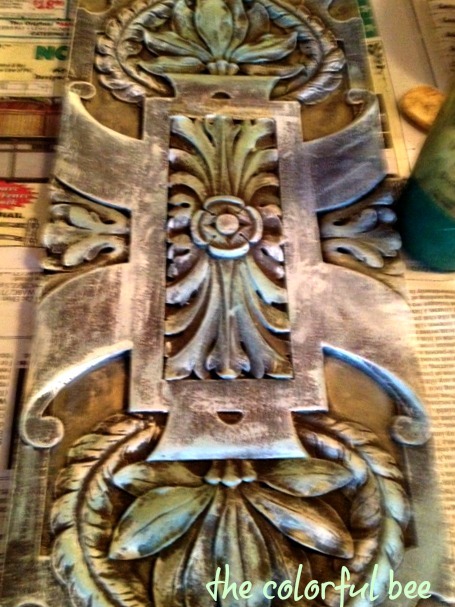 Then I dry brushed and highlighted a lot of the raised ornamentation in Annie Sloan Old White. 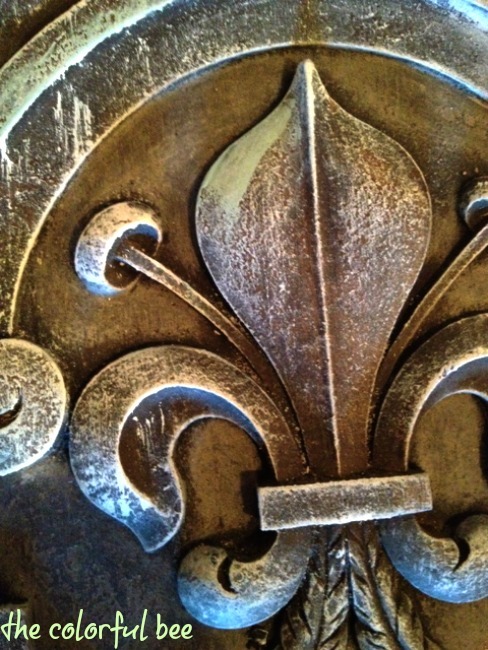 Then I took a little bit of Paris Gray and some Duck Egg Blue Chalk Paint and highlighted some of the raised areas that were more floral (the leaves and the fleur de lis parts). It needed a little extra “oomph” so I used some Verdi Gris colors from Faux Effects – their mid tone and lightest blue green colors. This added a little more life to the piece. To finish it off, I took some dark brown faux crème color (from Faux Effects – or you could use a dark brown acrylic paint) and added some age and darkness in the recessed parts of the piece – and a bit on some of the leaves as well. I am not sure where it will go exactly – perhaps in my Master Bedroom or bath…but here it is temporarily in my kitchen. 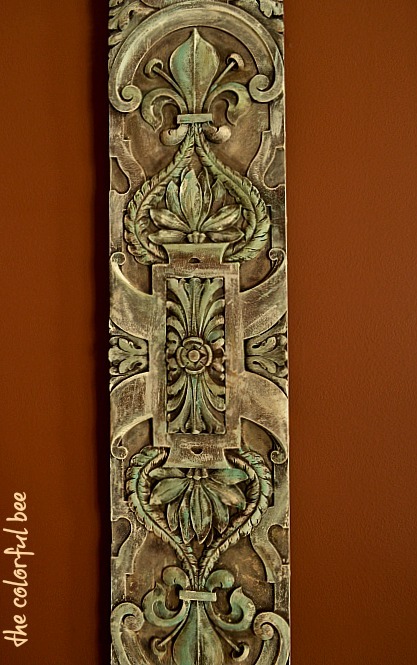 I love doing these ornamental fragments – they can be placed in narrow areas of your home…above doorways, which is what I will be doing with that other board (so stay tuned!). These lovely architectural elements seem to be plentiful in antique shops because they have been parted from their original sources. 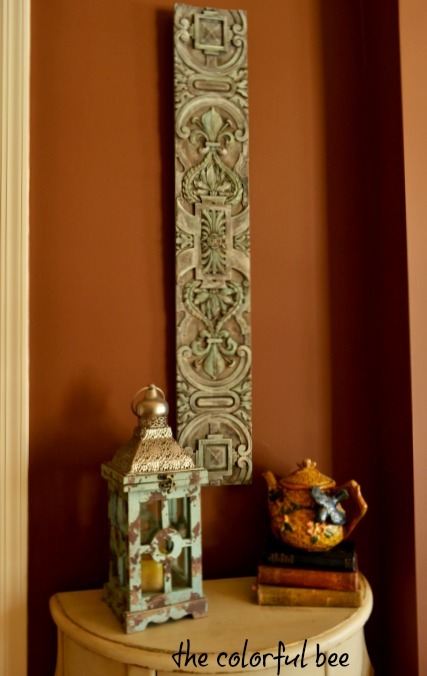 They add some history and heritage to your home. What have you painted lately? 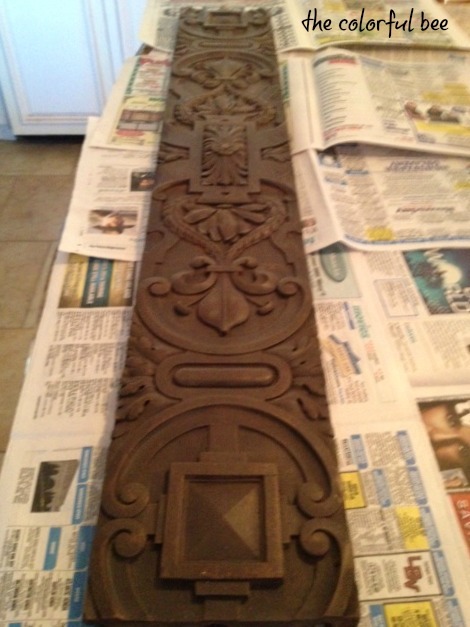 Have you picked up any architectural fragments like these? Let me know! 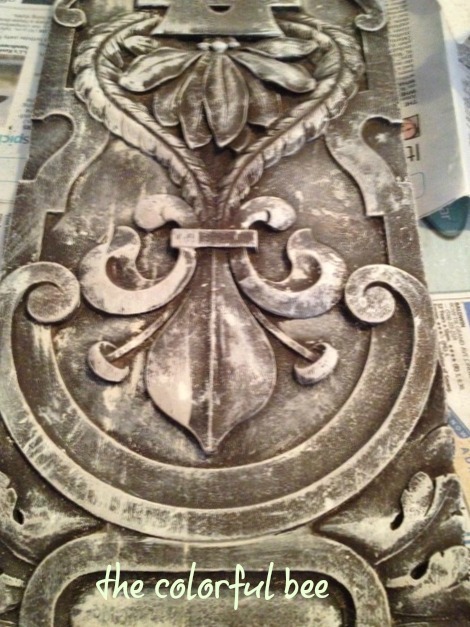 This entry was posted in Annie Sloan's chalk paint, Decorative Finishes, interior design, Makeovers, Paint, Tutorials and tagged Annie Sloan Chalk Paint, antiquing, architectural fragments, Faux Effects, faux finish recipe, faux finishing, Old White Chalk Paint, Paris Gray, Verdi Gris finishes. Bookmark the permalink. Beautiful job, Linda. You never cease to amaze me. Would have loved to go through that shop with you in New York! Stay warm! Hi Mary – trying to stay warm! It’s actually pretty nice today. We will have to shop together here on Long Island one day…and then down in your neck of the woods! Amazing transformation and especially like the Duck Egg Blue. 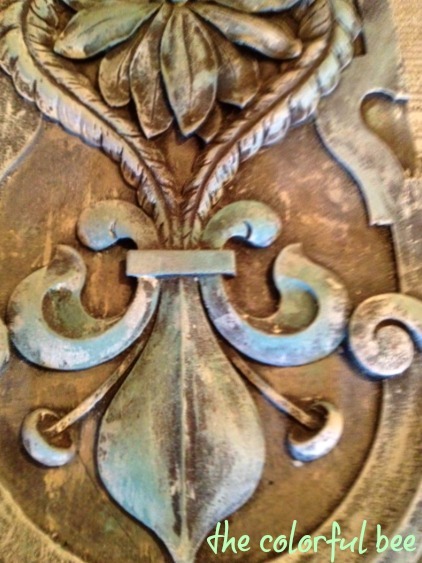 This post has given me new eyes to look at pieces of antiques, so thank you. I had to Pin to my DIY board, but this piece deserves it own kind of board too. Thanks Sue. I loved doing it…glad I came across this piece. I hope to find others like it! Love your comments! 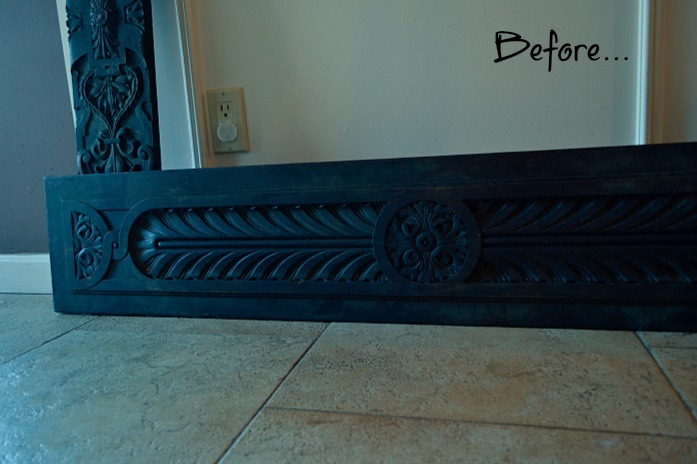 You did such a beautiful job on these decorative boards. I love the variations in color! Thanks so much Sherry. It was a great find – and one that didn’t take me that long to do (a bonus!). Thanks so very much for commenting! I just ran across your site today and boy am I glad I did. We moved into our current home one year ago. I only have 4 paintings on my wall in my living room wall so far. I have not decided what style I really want to go with as of yet. I need help for sure. I am an artist and as far as paintings and pictures for my walls I can paint about anything that I would like to have. Problem is, I just don’t know what that might be yet. I have barely scratched the surface here at your site and I am hoping that I might get some ideas so I can quit living in a bare cardboard box. I love color but I don’t like modern decor, I love Vintage everything! I really don’t know what my comment started out to be, sorry got sidetracked as usual but this piece is fabulous! I wish there were somewhere here for me to find such things. Hi Susan…thanks for commenting. Isn’t it funny that sometimes artists who can paint anything…have trouble figuring out what to paint for their own home. I have similar issues, but for the most part I do ok. 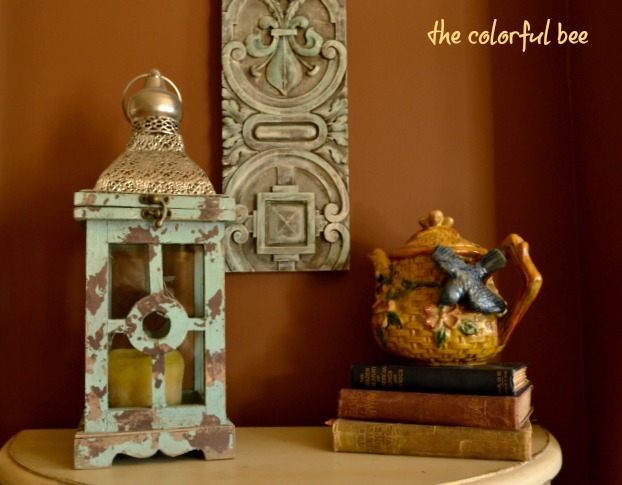 If you love vintage – think about the colors of vintage things and vintage items themselves. Paint pale aquas and pale greens in a washy background and then perhaps an ink drawing over it of an old bicycle, manual typewriter…baskets of flowers. 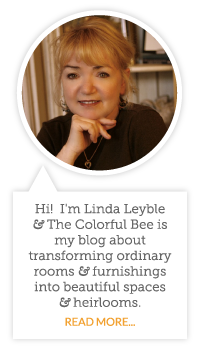 Think in terms of the colors you want to bring in in your home and have that be the background – with ink drawings over that of vintage things you love (birdcages etc). Start with some simple ideas to fill your walls first…and if you don’t totally love them later, you can always transplant these paintings to a bathroom, guest room or your bedroom. You could also do some shadowboxes and place items inside them for a quick fix. Maybe do an entire accent wall with an all over stencil. Let me know what you come up with. Would love to see your artwork!